I’m Mitch Matthews and welcome to DTD. Today we’re going to digging into a wildly important subject: How to inspire our kids to dream! I had a conversation with a DREAM THINK DO listener who had reached out and wanted to chat, wanted to connect. This morning we had an awesome conversation and, almost instantly, we just dropped into it because, hey, in the DREAM THINK DO family, we’re in it together, and I could tell something was heavy on his heart, something that he wanted to dive into and, almost instantly, we went there, and that was … He just let me know that he just … He had three daughters, and it was just heavy on his heart to help them dream. You could just tell he was just really torn up about it, and I get it, man. Being a dad is one of my absolute favorite things, but it’s not easy. Being a parent is not easy, and if you’ve got kids, you know what I’m talking about. It’s one of the best jobs on the planet, but it’s not easy especially on this subject and, in some ways, it’s just easier to avoid. It’s easier to just stay busy, not talk about these things, just keep things status quo. In fact, I opened this conversation up a little bit, too, and so I’m going to do some things here at the front end that I usually do at the back end. One is I want to invite into this conversation because, I guarantee, we’re going to do more conversations on this subject because it’s so important, so I want to invite you. As you think through these things, I want to hear your tips, your strategies, maybe even your … what you wrestle with, so hit me up, mitchmatthews.com/222, and leave a comment. What are some of those strategies you’re doing or what are some of the things you wrestle with, or what’s something that’s worked for you and your kids? I want to hear from you about that because we’re going to be doing more on this subject, and so, yeah, you guys are awesome and you guys are wise, and we’re in this together, so I want to hear from you, so mitchmatthews.com/222. Leave your comments there. I also want to say maybe you don’t have kids, maybe you’re listening to this episode and you’re like, “Check. Maybe not me,” or maybe that you’re just not feeling that right now. I just want to say that what’s interesting is is that, as we start to talk about encouraging our kids to dream, and it could be your kids, it could be your own children, but sometimes these strategies are the exact things we need to be reminded of for ourselves, some of the things that we’re going to talk about, I’ve got some specific things we’re going to talk about today, and it could be things that you could apply to yourself as you’re thinking about your own dreams and goals. They could be things you could apply to other people in your life, your friends, your family members, maybe even co-workers or employees. Trust me, there are some things you’re going to be able to apply whether you have kids or not, but if you do have kids, I just want you to, hey, lock in, buckle up, and let’s do this thing together and, as you’re doing this, too, I want you to think about maybe some other parents, other people that you know that should hear this episode, and I want you to be thinking about them because I want you to share it with them, because here’s the thing is I believe that we need to be talking about this. I believe that we need to be encouraging our kids to dream, and this is not an easy thing to do, but it’s so critical, and so I want to invite you into this conversation and I also want you to invite others into this conversation because I want to keep it going. That’s a little background on how we got here, where we’re going with this particular episode, and this is really just a conversation between you and me, but I’m hoping it’s also going to give you some strategies, some things to think about and some conversation starters to be able to go after this, and some of the things that I think probably are going to be really enforcing the stuff that we’ve talked about in other Dream, Think, Do episodes, but some of the stuff is not stuff I’ve talked about before, and it might be surprising to you. The first strategy we’re going to talk about, and this is one that might fall into the surprising category, is … This first strategy is don’t use the dream word. How about that for surprising? This podcast is called Dream, Think, Do. Is it shocking or not? I would highly suggest, when you’re talking to your kiddos, don’t use the dream word. Dreaming is wildly important. We want to encourage ourselves to dream. Dreams are important. We want to encourage others to dream, but sometimes, when we’re talking to our kiddos, that dreaming word can be a little intimidating. It’s just big. It’s weighty, and weighty and big is not necessarily bad, but when we’re talking to our kids, sometimes that can just feel so out there that it’s tough for them to get their heads around, or maybe it’s easy for them to dismiss, like, “That’s for other kids,” or, “I don’t know what my dreams are,” and so it’s easy to just walk away. Here’s the thing, something that might be even more surprising to you, if you’re a long term Dream, Think, Doer maybe not, but what may or may not be surprising to you, it was definitely surprising to the Dream, Think, Doer that I was talking with this morning, but dreaming doesn’t actually come easy for me, that’s right, the creator of the DREAM THINK DO podcast, the dreamer behind the Big Dream gathering, all that stuff. Mitch Matthews: Part of the reason why I do this is I know first hand how tough this subject can be because sometimes it’s intimidating. Sometimes, there’s a lot of pressure that comes with getting clear on your dreams. In some ways, I mean, isn’t it just easier, not better, but sometimes it’s just easier to not get clear on these things because, once you start to get clear on goals and dreams, sometimes accountability comes with that. Sometimes pressure comes with that. I think it helps you to live a bigger and better life, but sometimes humdrum is tempting. Maybe you can identify with that, maybe … or identify with that as far as maybe your kids have given you that brush off or like, “Nope. Not doing it,” or maybe deep down inside you’ve had those thoughts where it’s like, “Yeah, I’d love to get clear on some goals and dreams. Yeah, I’d love to be able to write some of those things down. I’d love to be able to pursue those things,” but maybe you haven’t been able to bring yourself to that or maybe you did it one session a few years ago, but you really haven’t brought yourself to go after it since, and that’s because it takes work. It’s a little scary. It’s a little intimidating. The big thing is is that I’d say with kids to start by giving them the permission to not necessarily have to define their dreams. In some ways, what I like to do when I’m talking with our own boys … and, by the way, I’m a parent. My wife and I, we have two boys. They are now 18 and 20, and parenting is absolutely one of my favorite things, but … and I have not done all this stuff that we’re going to be talking about perfectly, so I’ve got some of the scars, they’ve got some of the scars to prove it, all of that, but I’d suggest, as you’re talking with your kids, maybe lay off the dream word. Maybe even lay off the goals word. I like to use the words, especially when I’m first starting this conversation, to be able to say, “Hey, what are some things you dig? What are some things you enjoy or what are some things you love doing?” and, if they don’t know, to be able to say, “What do you think those might be?” For some kids, man, there’s just so much pressure to just be normal. There’s so much pressure to just be like everybody else, and so it can be intimidating to even think about doing something outside the norm, or sometimes there’s so much pressure to be excellent at something so fast, or maybe kids have been doing it since they’re three, and maybe your kid is interested in something, but they haven’t had that experience, and so there’s pressure. Even verbalizing that and say, “Well, you know, I’m kind of interested in this,” or, “I’m kind of, you know … This, this would be kind of cool, I think,” sometimes they’re even afraid to verbalize that because maybe they know a kid that’s already really good at that and maybe they’re already comparing themselves against that kid or even the perception of that kid, whether they should be further, and so just start that conversation of what might they be interested in or what might be some of the things they could enjoy. What are some of the things that other kids do or what do they see some of the things other kids are doing even on the Internet that they might be interested in? Start the conversation there. Maybe don’t weigh it down with, “What are your dreams? What are goals?” Let’s just start to try to explore, either finding some things that they’re interested or being able to say, “Oh, let’s, let’s find those things you’re interested in and let’s see, you know, what are some of the things you love, what are some things that you’d be excited about.” All right, so it start with not using the dream word. Then what we’re going to do is we’re going to move forward under the banner of experimenting. Now, if you’re a longtime Dream, Think, Doer, you know that we are big fans of experimenting, trying different things. Just as I alluded to just a few seconds ago, I think we live now in a culture of pressure for our kids. There’s so much pressure to specialize. There’s so much pressure to be really good at something early on, and I don’t mean to sound like an old fart, but, back in my day, when I was growing up at a small town in Iowa, you had to go out for every sport because they needed you to go out for every sport. Even though I was terrible at most sports, they still needed me to go out because I needed to fill the bench, I needed to help with practice, I needed to do those things, so I tried everything, track, basketball, baseball, wresting, football. We tried it all because we needed to. That was in some ways the expectation, but you’d only do it for maybe a few months tops, two months, and then you move on to the next season, which I celebrate that. Now, here’s the thing. Some kids fall in love with one particular sport, and that’s all they want to do, and if it’s truly out of passion, I celebrate it, I go for it, but it’s almost become the norm now to specialize at a very young age. You guys know this especially if you have kids that, man, if your kid seems really good at baseball, there’s a real temptation to get him into baseball 10 months out of the year, or if they’re really good at swimming, then let’s do 10 months out of the year with that just swimming or those kinds of things. Again, if it’s passion, it’s something they really enjoy, then awesome, but most kids that I interact with, and I do interact with quite a few, a lot of times, it’s more out of pressure as opposed to passion, or maybe it’s something that their parents are really familiar with or something their parents excel at and so it’s really easy for them to just fall into or, in some ways, get pressured into doing something their parents did. What I love about experimenting and trying or moving forward, trying some new things under that banner of experimenting is that it really tends to open things up. It tends to relieve the pressure a little bit to be able to say, “All right, we’re going to try some different stuff.” When you experiment, I mean, we’ve talked about this a little bit before, especially if you take that approach of a scientist, a scientist goes into the lab and says, “All right, I’m going to experiment. This is what I think is going to happen. We’re going to try it out. We’re going to see what happens, and then, you know, we’ll make some assessments based on that,” and if the experiment goes the way they thought, fantastic, but if it doesn’t go the way they thought, that doesn’t mean that the scientist is not a success or that the scientist is a failure or that the experiment was a failure. In fact, it doesn’t mean that at all. It means the opposite of that. It means you’re learning, and that’s what … With our kids especially, we always tried to experiment. We always tried to do different things, and it’s okay to experiment and try some different things even with things that maybe your kids or maybe you’ve never done. Now, I’ll give you an example of this. Now, I should tell you our boys, and I mentioned this in other episodes, but our boys love making short films. Both of them enjoy writing now, and one in particular, our younger son, really likes to be in front of the camera. He’s a very good actor. Our other son is a really good director. He likes to be behind the camera, and so that has actually made for a pretty successful partnership for them. They’re almost up to 30 short films that they’ve done in the last couple of years, which is amazing, and they get their friends involved, and pretty amazing productions now that really are driven by them, but, early on, when they were younger, neither of our sons really landed in sports. They both had athletic prowess in different ways, but the sports thing just didn’t connect. Now, my wife was an incredible athlete. I, as I mentioned earlier, was not, so we both were really open to them being in sports, but we were also really open to them finding their thing, and that’s what we really wanted to do is we wanted to just continue to experiment and find their thing, and I can tell you that, right around the time where our older son was about eight and our younger son was six, they both tried some things and just … They were figuring out that sports weren’t quite their thing. One of them had a pretty rough experience in a team setting, and then, the other, it was just … You could tell he just wasn’t finding his groove. Some of the organized sports weren’t happening. The sports in the gym and gym class weren’t happening, and so we really just said, “All right, let’s just start doing some experimenting,” and I’ll tell you how this goes. We didn’t use the word dream. We were just like, “All right, what do you guys like?” and I remember them talking about that they really loved movies. They enjoyed watching movies, Disney movies, Pixar movies. I was like, “That’s awesome,” and then I thought, “Well, what if we made a movie?” and they were like, “What does that, what does that mean?” I mean, it’s a little bit to get a six and an eight-year-old to even understand how that would work, but we started to talk about what would be some of the basics of that. They were really into Legos at the time, and so we started to talk about maybe we could do a stop-action movie, and we did some experimenting on that. I’ll put up a couple of examples of what we came up with, mitchmatthews.com/222. You’ll see them, but then we were like … The stop motion was really hard and painstaking. They were into it, but it was tough, and so I said, “Well, let’s just storyboard it out,” so we started to talk about movies that they liked, and then we started to talk about the Legos that they liked. There was a particular type of Lego called Lego Agents that they really loved, and so I said, “Well, let’s do a storyline with Lego Agents,” and so we just took out some paper and we started to draw out what the storyline was because we’d seen some of these “making of” things on DVDs or extras, and you saw the storyboards and stuff especially for animated things, and we were like, “Let’s just do this.” Plus, them writing, that’s a little intimidating, all of that, but they got pictures and almost like a comic book. They understood that, and so we just put together the storyline and really let them drive the storyline. It was definitely not a storyline that was going to win any Oscars by any means, but it still was one of those things where we got to talk about it. “You’re probably going to have a good guy. You’re probably going to have a bad guy, and the bad guy is going to probably do something that the good guys are going to need to go do and respond to, right?” and, to be perfectly honest, what we did was we nailed down the storyline and said, “We’re just going to do it for a few minutes. We’ll just do a few minutes of the movie,” but … and so our movie just wound up really being two good guys meeting, and you don’t really know what the bad guy is doing, but they’re meeting and they’re going some place, so real basic, again, not winning any awards, but it was something that really allowed them to see what it was … what it would be like to create the movie and then to shoot the movie and then to pull it through. That’s what we did. We experimented, and what was great was we did it, and then they instantly started to go making films. Nope. That’s not it at all. We did it. We showed the grandparents the videos, and I will tell you that we didn’t revisit making movies for probably five years, but what’s interesting is is that, or maybe even more, but what’s interesting is is now the seeds that were planted there have started to grow, and now they’re all about it. Now, I didn’t necessarily know that that was it, but what we did was we just did a lot of planting of seeds during that time, and even if it hadn’t grown into something that now they’re both moving into professionally, what … We did a lot of experiments. We planted a lot of seeds, and some of those seeds never saw the light of day. Woodworking went down in flames. There was a number of different things that we tried that just did not work out, but every experiment plants some seeds of possibility, and you just never know which ones are going to take root and start to grow in different ways. Literally, probably it was more than five years ago, or five years later, but I started to see them write stories, started to talk about possibilities. We got a new camera for something else that we were doing, and so they decided to shoot something with that and they started to experiment with editing and all of those things, and all of it came back. It’s funny, years later, we were talking about one of the movies they were shooting, one of the short films they were shooting, and I actually brought up the Lego Agents movie that we’d shot, and it was funny they almost had forgotten it. They’d almost forgotten it, which is understandable. They were six and eight at the time, and now it’s almost 10 years later when we were talking about these things, and it was interesting. At first, my heart was a little broken, like, “Ah, they didn’t remember like all that work that we did and all the fun,” but it really didn’t matter that they didn’t necessarily remember it. We did pull it back up. It’s on YouTube, so we pulled it back up. We laughed about it and all those things and, of course, they remembered everything at that point, but what I realized was that that’s exactly how seeds work sometimes. They get planted, and then they get watered in certain ways, and sometimes that’s you, as a parent, you’re continuing to water those things. Sometimes they get watered and fed in different ways, and then they can take root and grow. When we do it from the mindset of doing a sprint, and for you Agile practitioners, that is definitely an Agile strategy, but to do sprints, it just take that pressure off, the pressure of saying, “Oh, we’ve got to figure this out, and this is what you’re going to do the rest of your life,” but to be able to say, “No, we’re going to do this, and we’re just going to do this for three months. We’re going to do it for two months. We’re going to take this class and then we’ll see how it goes after that.” or, “We’ll do this project. We’ll shoot this Lego Agents movie and then maybe it’ll never see the light of day. Maybe you’ll never do another project, or maybe just … Maybe those seeds will grow into something amazing that you might be doing the rest of your life,” so, experimenting, there we go. Mitch Matthews: One of the next things I want to do is suggest inviting ownership. Inviting ownership. Allow them into the decision-making process. This goes back to maybe it’s not about helping them find their dreams or clarify their dreams, and maybe some of your kids are totally ready to do that and, if they are, that’s awesome, use the dream word, but I know, for me one of the other seasons was our younger son was interested … He was really trying to still find his thing. He was probably about 13 at the time, 13, 14 at the time, and still the sports thing, not his thing. He was, again, really pretty athletically inclined, but just the organized sports was not necessarily his thing. We tried some different club sports, school sports, all those things, but it just wasn’t his jam. It just want his thing. Mitch Matthews: About 13, 14, he decided, he was interested, he thought maybe he’d be interested in doing some martial arts, and I was like, “Oh, that’s awesome. I mean, what a great thing to know, what a great thing to learn,” and I have some history in martial arts, and we’ve talked about this. I even, I think, mentioned this story on Dream, Think, Do, so, if you’ve heard this, stay with me, but, at first, I was like, oh, man, I was really, really tempted to just take this and run with it because, back in college in that era, I got into TaeKwonDo and did it for about five, six years, helped to teach it, all that stuff. Mitch Matthews: He had a budget, but at the same time he knew he could go outside that budget as long as he came up with a solution, and so what we did was then we started to go to these different schools, and some were awesome and some were not, some you could come and watch, others you had to come and participate, all of those things, but I really let him drive it. I would be there. I would watch, but when we got done, I’d be like, “All right, what, what do you think? What was the vibe? What did you think of the instructor? How did you … What did think of the other students? What did you think of the dojo, the … you know, the space, all those things? How did you feel when you left?” and really just invited that conversation. Mitch Matthews: What was also interesting was that he said, “I want to go to a number of schools, but I want you, I want your input on the number of schools. Like how many schools do you think we need to go to in order to make this decision?” and we settled on … He came up with the idea of going to five schools. Now, what’s interesting is that, by the time we went to the fourth school, he’d made his decision. He felt very strongly about it. Mitch Matthews: What was great was, in the end, he picked the school that I would have picked for him, but what was amazing about that was that not only did we agree to experiment with it and say, “All right, we’re going to do this for three months,” and, basically, in that case, instead of just doing a timeframe, what we did was we decided to say the sprint. The experiment was going to be the first-mile marker would be a testing, a belt testing, so that was about three months, but, in that case, instead of time, we decided on our timeframe based on a mile marker or an event, and that was that first testing, but he really had the opportunity to own that decision throughout. Mitch Matthews: Once we signed up, then he agreed that he was going to go all the way through to that first testing, and then what we had was we have bailout clause, so the whole idea was to select your school and then go to that first testing and, if you still liked it, you can keep going. He could still keep going, but if he didn’t, then he could bail, but, in that case, even if he bailed, there was no part of that that was a failure. Mitch Matthews: There’s no part of that that was wasted time because, even though we went to four different schools and he landed on the one, he landed on the one that I would have picked for him anyway, what was he doing? He was learning how to make decisions. He was learning that his voice mattered. He was learning to observe and also think about how things made him feel, what made … how to make him think, what did it make him think of, what did it make him think of himself, all of those things, so we invited ownership, and it made for some amazing conversations. Mitch Matthews: Because we had agreed upon, as even a part of the ownership was to be able to say, “All right, you know, what do we want to have, what do we want to have as the sprint? Is it just a matter of time or is it just testing or getting to a testing?” and so we decided together that he was going to go at least to that first testing, and what was amazing was he actually loved it and stayed with it for two more years until he got into a different program that was … that took all of his time, and so he had to stop and make a decision, but, for him, that process was incredible, and it was because of the ownership. Mitch Matthews: Listen, we’ve done that a number of times, and sometimes it didn’t work out so pretty and sometimes I wasn’t as good at disciplining myself and shutting up and truly letting them drive the decision and all those things, but when you do that, it’s amazing, and so I want you to just be thinking about where might be some ways or how might you invite a little bit more ownership into the decisions as you decide on an experiment, as you start to think about where you might try some things. How could you invite the ownership? How could you invite them into the decision and help them make that decision, what that might look like for you? Mitch Matthews: Okay, we’ve got don’t use the dream word. We’ve got experimenting. We’ve got inviting ownership, and then also one of the last ones we’re going to talk about is inviting the conversation, looking for those opportunities to have a conversation. Sometimes it’s when you get that opportunity to have some ownership to be able to say, “All right, what do you think? What did you like? What surprised you? What sucked? What was harder than you thought?” and really having some conversations around that. Mitch Matthews: Now, I will give you one hack on this front, because I’ve got dudes, and dudes aren’t necessarily known for being super talkative, but one of the things that a good of friend of mine, he’s been a dad longer than I am, Drew McLachlan, he’s also been a guest on Dream, Think, Do I think even a couple of times, a good friend, amazing dad, one of the things he helped me out with, because his daughter hit the teen years before our boys were even close and so he started to give me all these tips that really helped. Mitch Matthews: One of his strategies was, if he ever really wanted to have a great conversation with his daughter, he would always try to have it in the car. When his daughter was a teenager, early teenager, she would sit … He would pick her up from school, and he knew that was the window. Now, she sat up in the front seat. She was old enough to sit at the front seat, and he knew that somehow the car had become the safe place, and we had all sorts of guesses on this, whether that’s because you don’t … you’re not sitting face to face, and so eye contact isn’t necessary or you don’t have the pressure of body language or those kinds of things. Mitch Matthews: He just said, “I would just be present. I would be fully engaged. I wasn’t distracted other than driving, and I just asked, you know, ‘How are you doing? How was the day? '” or if it was a bigger conversation or maybe they had done some experimenting of whatever she was finding out about trying and digging into all of those things, he would really go after the conversations there because he knew sometimes getting home could be a little overwhelming or were … there’s just so much going on, those kinds of things, so he looked, he would use the car trips and time in the car as his hack for having better conversations. He would even admit that sometimes he would take an extra trip somewhere, drive a couple of miles longer than needed just to keep the conversation going. Mitch Matthews: Invite that conversation. As they’re going through it, as they’re doing it, look for those windows where your kids might be more open to a conversation. I know I use the car trick all the time and all that, or maybe it’s around the dinner table where you go distraction-free, no phone, no interruptions and you just have those windows where you can just have those conversations, but invite that conversation and just see where that goes, so, all right, we’re going after a lot here, but we’re going to go after a few more, so don’t use the dream word, experimenting, inviting ownership, inviting conversation. Mitch Matthews: I throw that out because I think that pressure exists. You know it does. I mean, for students, sometimes to think, “Oh, my gosh, you know, I’ve got to get this and I’ve got to get it right because, if I don’t get it right, then I’m going to be behind,” or, “If I don’t get it right, I might be stuck in something the rest of my life or at least the rest of my school years,” or whatever, and to be able to say, “No, this is an experiment,” and so to be able to say, “All right, what’s our bail clause? When can you quit with intentionality?” That’s a great conversation to have as well. Mitch Matthews: It also was one of those things that stretched him a little bit because, I can tell you, we made the commitment that he was going to be at a certain number of practices each week, and there was one particular morning during that first sprint, that first experiment, where he got up and it was cold outside. It was a Saturday morning. It was really tempting to just sleep in. It’s like, “We made the commitment, right? We can quit, but not today, right? We’ve got our bail clause, but that isn’t for another few weeks,” and so because he had the ownership into that, he was open to that, and because we’d had that conversation early on, we knew that … or he knew that he could quit, but that day wasn’t the day to quit, and so that helped. Mitch Matthews: I’m a big fan of allowing intentional quitting, but to have that conversation early and to be able to speak to that, so, hopefully, that helps a little bit. All right, don’t use the dream word, experimenting, inviting ownership, inviting conversation, allowing intentional quitting. Okay, the last one, the last one we’re going to talk about is to invite them into some of your dreams intentionally, not manipulatively. Manipulatively is a word, right? All right, so inviting them into your dreams, inviting your kids into some of your dreams intentionally, not manipulatively. Mitch Matthews: We all know that jackweed that makes his kid do the same sports that he did because he’s basically living life through his kids. We’ve all seen that dad or that mom at whatever it is, little league sports or club sports or whatever, and you can tell the kid is not enjoying it at all, but maybe they’re even good at it, but you can tell they’re doing it out of expectation or pressure or manipulation, and there’s no joy in that. It’s brutal. It’s ugly. It’s nasty. We don’t want to do that, and that’s not Dream, Think, Doers. Mitch Matthews: Here’s the thing is I think one of the ways that we can encourage our kids to dream, that we can encourage our kids to experiment, to even take ownership, to step into these things, to take some risks is to do the same thing, to model it, and here’s the thing is that I’m not talking about trying something brand new every week or signing up for a night class every week of the year. That’s not what I’m talking about at all, but I do think we can model some of these things. Mitch Matthews: By inviting them in once in a while, windows of time, specific events, what does that is that invites them in, it allows them to get to know you. It allows them to see you walking on a dream or walking on something you enjoy, but, at the same time, it doesn’t pressure on them to always do that or to have the same dreams and goals. Mitch Matthews: For me, another kind of extreme or weird example is that you guys know I have a Jeep Wrangler. I love my Jeep, and I have a buddy that we go four-wheel. We take them off on a wheel-four drive trails and things like that sometimes, and my boys appreciate it, and they appreciate my good friend that I go out with and do these trips with. He’s like an uncle to them, and so it’s fun for them to see it. Now, at the same time, it’s not necessarily their thing. It’s not their jam. They don’t love the Jeep. They appreciate the Jeep, but they don’t love the Jeep like I do, but one trip a year, and it’s usually just a day trip, just a day trip. We’ll go out and they’ll participate. 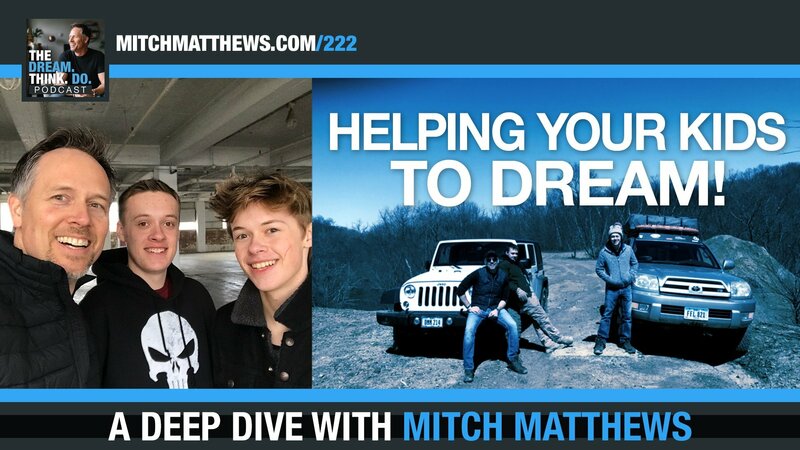 Mitch Matthews: What’s fun about that is that has given us some shared experiences, some fun adventures, a lot of laughs, just examples of dad totally screwing up and how I drove the Jeep or driving into a huge mud bog and getting stuck and all of those things and working through those things together. I invite them into windows of that dream so that we can share it together, but also so that they don’t feel the pressure of always being in on that dream, and so they get to see the messy … messiness of me pursuing a dream. They get to see the example of that. Again, I’m not a perfect dad by any means, but sometimes, just by inviting them in, what that does is that that allows them to see you in a new light as well. It allows them to see you trying something new, doing something different, but also but from the standpoint that you just … You’re inviting them into that window, but not into an expectation that they will always love that same thing, that dream in the way that you do. Mitch Matthews: Even using that vernacular to say, “Hey, I want to invite you to do this just this once or one time of year,” and even letting them know, “Listen, you don’t have to like it necessarily especially the rest of the year, but come and have some fun with me in this timeframe, in this window,” it will allow them to see you dream. It will allow them to see you experiment, maybe even make some mistakes, learn some new things, but also it will allow them to not feel the burden of them having to do the exact same thing that you’re doing, because maybe you had that pressure, maybe you had that expectation from your parents. Maybe your parents put that pressure on you, and so that’s maybe one of the reasons why you wrestle with doing this with your kids. Mitch Matthews: I’d say, hey, whether that’s going out on a Jeep, whether that’s going to a game or maybe that’s taking a night class, maybe it’s … maybe not taking your kid along to the night class once, but maybe it’s coming home and talking with them about your learning, what you’re learning or experimenting with, all those kinds of things. Invite them in once in a while for certain events or specific things. Have that conversation. Let them know what you’re excited about. Let them know what you’re afraid of. Let them know what’s going well and maybe even what’s not and just see what happens. Mitch Matthews: Now, of course, be age-appropriate. A conversation with a six-year-old is a going to be different than a 16-year-old, but I can tell you, sometimes sharing that I’m feeling stuck or that I’m feeling scared or overwhelmed or that I’m not exactly sure how this dream is going to play out or this particular experiment is going to play out, having those conversations even at an early age in age-appropriate ways certainly allows for much better conversations now that they’re 18 and 20 to lay the foundation, so I just want to invite you into that. Mitch Matthews: Man, we have covered a lot of ground in a short amount of time. This is all a kind of stream of thought, but I really, really get want to get this out to you, and I really, really want to hear what are some of your strategies, what are some of the things that you’ve done. Now, we talked about not using the dream word. We talked about helping them figure out some things that they might be excited about, some things they might enjoy, some things they might be good at. We talked about experimenting, allowance for some sprints, to try some different things. As you do, invite some ownership. Invite them into the decision-making, the selection, the timing, all of those things. Mitch Matthews: Sometimes, the very thing is to actually confess that a little bit with your kids, to be able to say, “Hey, you know what? I’m working on finding some new things that I really like, and I want to invite you into that conversation. I want to talk about that with you. What are some things that you like?” and, all of a sudden, it’s a conversation where you’re discovering it together. You’re not the heightened expert that has to have all the answers. You’re just two people who love each other, who are experimenting and learning together and, really, in the end, that’s what we’re all about here with Dream, Think, Do, dreaming bigger, thinking better, and doing more of what we were put on the planet to do, and the only way that we get to do that is if we do it together. Mitch Matthews: My hope is that if you’re a parent that some of these strategies will help you to do that more with some … with your kiddos, but even if you’re not, or even if you are, but you think of somebody else that maybe you could have some of these kinds of conversations with, I hope they help you to help others to dream bigger, think better and do more the freaky, cool stuff you were put on the planet to do, so that’s what I invite you to do. Comment and let me know what you think! I can’t wait to hear from YOU!